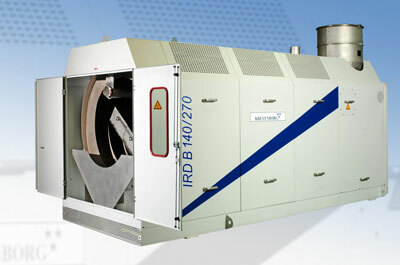 Infra red dryers from Kreyenborg offer the possibility to rapidly dry plastic materials. They are often used in PET applications to dry a blend of PET sheet flakes and virgin pellets. It is possible with the innovative IRD (Infra Red Dryer) technology to crystallize and dry PET material in less than 15 minutes. In comparison to conventional dry-air systems, the infrared rotating drum IRD operates extraordinarily efficiently by direct heat irradiation. 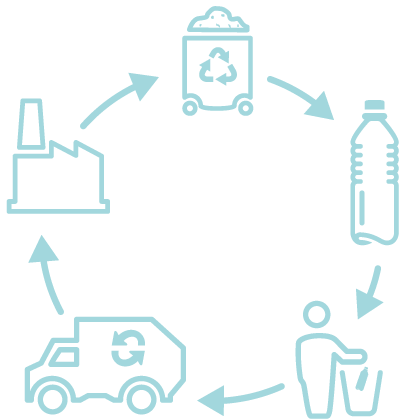 Energy consumption during production can be reduced significantly. The KREYENBORG infrared rotating drum IRD is the ideal alternative in the face of steadily rising energy costs. Traditional drying of PET bottle flakes prior to sheet extrusion for Thermoforming sheet is carried out using a crystalliser and desiccant dryer. In the past the main method was to first crystallise the PET in a Crystallizer for around an hour and then dry for approx 4 to 5 hours in a desiccant dryer. These long drying times consume a high amount of energy per kg of PET that is processed. In recent years a new technology has been introduced by KPT Kreyenborg plant technology that allows a much more energy efficient crystallizing and drying process for PET flakes and also Virgin PET pellets. The IRD (infrared dryer) crystallises and drys the PET to around 300ppm rest moisture in under 15 minutes. Then just about 45 minutes in a small buffer hopper is sufficient to complete the drying down to approx 50ppm rest moisture. Naturally this greatly reduced drying time offers dramatic energy saving for each kg of polyester that is dried prior to extrusion.